What is the significance of the convergence of the end times signs? Dr. Reagan: One of my latest books is entitled Living on Borrowed Time. It's about the signs of the times. I added a prophecy forum in there, which in fact all of you fellows were members of it along with a total of 22 other experts. I asked them this question, "Do you believe that we are living in the season of the Lord's return, and if so, what would you say is the most important reason?" I expected them to say that we were, and all 22 said, "Yes, we are living in the season." I expected them to say Israel becoming a nation again would be the most important sign, but they didn't. What the forum said instead was, and the view that convinces me the most, is the convergence of the end times signs. In other words, all of the different end times signs are coming together for the first time ever. There has always been this sign or that sign or that one, but not all of them coming together all at one time. Yes, the most important thing they said was Israel, but more importantly than that is the convergence of the signs. Surely it looks like that's what's happening today. Al Gist: I'm an engineer, so logic works for me. Logic tells you that the convergence of all these signs is an impossibility. You cannot have all these events happening simultaneously. Coincidentally or otherwise, this convergence couldn't happen that way, unless of course God was orchestrating the whole thing, which we know is the case. 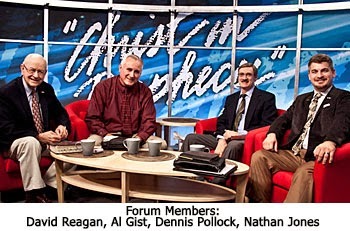 Dr. Reagan: One of the factors that we find when it comes to the signs of the end times from the teachings of both the Old Testament and New Testament is there's going to be an exponential effect in the sense that the signs will come more frequently and more intensely. For example, the 2013 typhoon in the Philippines was the largest wind storm in history and the most powerful. Again, every signs seems to be increasing in frequency and intensity. It seems like God is shouting from the heavens, "Jesus is coming soon!" Dennis Pollock: Jesus compared the end times to the birth pains and contractions of a woman. In many cases, women can go a number of hours having about one contraction an hour, and it is usually fairly light. But, at some point, it's like they turn the corner and that exponential curve kicks in. It becomes not every hour, its every 15 minutes, then its every 5 minutes, then one unending contraction, and then the baby is here. I think those of us who are sensitive and aware of these prophecies are looking for the turning of the corner, believing that either we've turned it, or we're getting very close to turning it. Dr. Reagan: I'm concerned about the fact that somebody may be reading this right now who really doesn't know the Bible and doesn't have a personal relationship with Jesus Christs. They're reading us talking about these horrible judgments that are about to come about the earth. Al, how can these people get a personal relationship with Jesus and have the hope of escaping the Tribulation. Al Gist: The name of my ministry is Maranatha Evangelistic Ministries. The word maranatha only appears one time in the Bible, and that's in 1 Corinthians 16. The word literally means "until He comes." When you add the second word of our ministry — evangelistic — to that, it means what we're all about. We want to evangelize until Jesus comes. That's to say we want to share the Gospel of Jesus with as many people as we can, so that people can miss the time of the Tribulation. The Tribulation will be a day of terrible, terrible wrath and destruction and death, but the Bible says in 1 Thessalonians 5:9, "That God hath not appointed us to wrath, but to obtain salvation by our Lord Jesus Christ." And so, that's the secret. Salvation in the Lord Jesus Christ will save us from the coming Tribulation, and of course from an eternity in Hell without God. Have you accepted Jesus as your personal Savior? If you haven't, I want to encourage you to think seriously about this, because the Tribulation is very near. How much time do we have? Not much, the signs of the end times tell us that's for sure. Have you come to that point in your life where you have asked Jesus to save you? From your heart simply say, "Lord, I'm a sinner. I know I can't save myself, and Lord, I am calling on you to save me. I trust Jesus for what He has done for me." I encourage you to give serious thought to that decision and give your heart to Jesus today.